The Powderhorn (Iron Hill) Carbonatite is located in Gunnison County in about the center of the southwestern quadrant of Colorado. It is a pear-shaped body which is essentially conical at depth, and is exposed over an area of about 12 square miles. 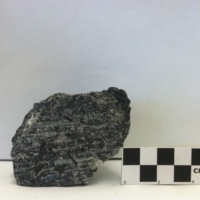 The carbonatite body covers about 2 and a half square miles; About 70 percent of the in pyroxenite which was subsequently intruded by or replaced by nepheline and melilite-bearing rocks; magnetite-perovskite, and carbonatite. 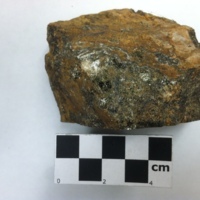 Mitchell, R.H., 2014, Primary and secondary niobium mineral deposits associated with carbonatites:Â Ore Geology Reviews,Â v. 64, p.Â 626-641,Â doi:10.1016/j.oregeorev.2014.03.010. Full Article. Focuses specifically on the formation of niobium in carbonatites but includes an excellent baseline description of carbonatites. Nash, W.P., 1972, Mineralogy and Petrology of the Iron HillÂ CarbonatiteÂ Complex, Colorado: Geological Society of America Bulletin, v.Â 83, p.Â 1361-1382, doi:Â 10.1130/0016-7606(1972)83[1361:MAPOTI]2.0.CO;2. Full Article. Bulk rock chemistry description & maps/diagrams showing the location of rocks in the Powderhorn Carbonatite. Temple, R.K., Grogran, R.M.,Â 1965, Carbonatite and related alkalic rocks at powder horn, Colorado:Â Economic geology and the bulletin of the Society of Economic Geologists, v. 60, p.Â 672-692, doi:Â 10.2113/gsecongeo.60.4.672. Full Article. Basic information regarding the structure, geochemistry, and petrogenesis of the Powderhorn Carbonatite. Van Gosen, B. S., Lowers, H. A., 2007, Iron Hill (Powderhorn)Â carbonatiteÂ complex, Gunnison County, CO; a potential source of several uncommon mineral resources: Mining Engineering, v. 59, p. 56-62, doi: N/AÂ Abstract. Olson, J.C., Hedland, D.C., 1981, Alkalic rocks and resources of thorium and associated elements in the Powderhorn District, Gunnison County, Colorado: USGS Numbered Series, Professional Paper , v. 1049, p. C1-C34Â Â doi: N/A. Full Article. 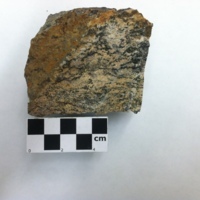 Extensive report by the USGS regarding rock type and history of formation (geologic ages). 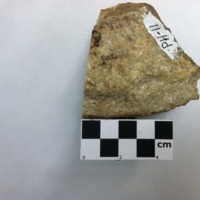 OCR PDF of supplemental information for the Powderhorn Carbonatite collection. 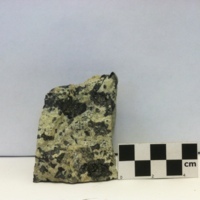 Coarse pyroxenite, with traces of nepheline. This is the freshest pyroxenite that was found. It occurs near the nepheline syenite body in the eastern part of the complex. 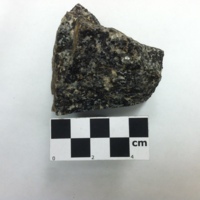 Fenitized Gneiss. 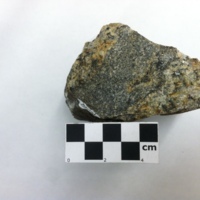 Gneiss discovered in direct contact with pyroxenite in prospect trench on ridge, about 500 ft. west of PH-1.. .
Nepheline syenite that outcrops on west side of trail at about 9200 ft. on east side line of section. Nepheline Syenite. 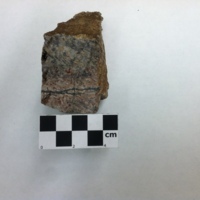 Thin, dark vein runs through the center body of the rock. White Carbonatite. 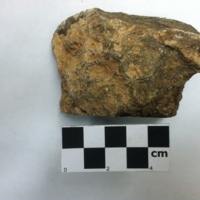 Found on Southwest side of the main rock unit body on North side of Beaver Creek about 1/4 mi. Recently exhumed ijolite from shallow bulldozer cut. 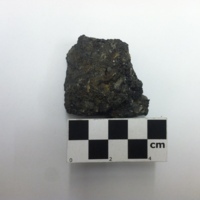 Rock is comprised predominately of a dark fine grained matrix. Some specimens have minor amounts of pink K-feldspar. 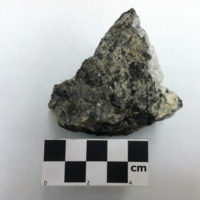 Clusters of biotite (~1 cm in diameter) appear on one face of the rock. 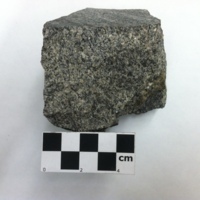 Coarse gabbro, extracted from the southern dike of two east-west dikes N of Deldardo Creek. 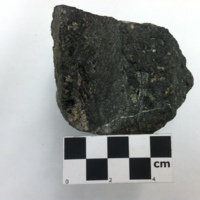 Entirely coarse-grained rock except for 2 cm wide dark fine grained band. Obvious traces of oxidation appear on all sides, dominating the most weathered sides of the rock. Light brown to almost off-white fine grained Carbonatite. 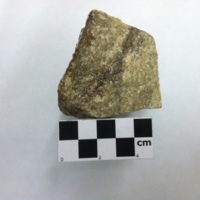 Delicated Barite appears in very thin layers on one side of the rock. 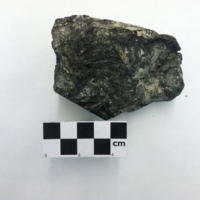 Chert sample found in a Carbonatite. Pink to light brown chert sample that contains small (< 1 mm diameter) vesicles. Very thin quartz veins propagate through the sample in no preferred orientation. Coarse grained pyroxenite showing heavy traces of oxidation on every weathered face of the rock. Large clusters (5-8 mm) of biotite appear throughout the rock. Large (1 cm-2 cm) dark grey to translucent quartz crystals comprise the matrix of the rock. Melilite minerals propagate consistently paralell to one another throughout the rock. 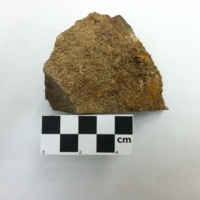 Three hand samples from different facies were collected to represent this sample. 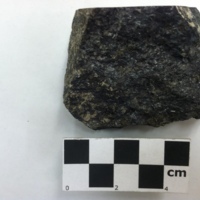 Out of two of the largest samples one is a dark fine grained rock while the other is coarse grained. 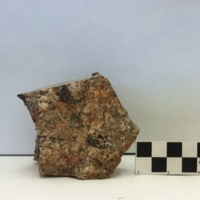 Both contain large (5-8 mm) clusters of biotite. 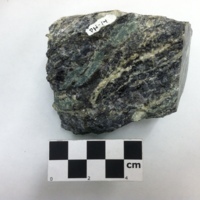 The rock is largely comprised of a very fine grained light green matrix with large (1 x 3 cm) black equant galena crystals. It's pretty magnificent. Rock is comprised almost entirely K-Feldspar. All weathered faces of the rock show heavy traces of oxidation.